Anti – Wrinkle Injection is one of the most commonly performed non invasive cosmetic procedures worldwide in men and women alike. People today want to look relaxed, fresher and have accepted that anti wrinkle treatment can make you look fresher and younger even WITHOUT making you look plastic. In the current scenario more and more younger patients come in for this treatment and in order to look rested and more pleasing. The answer is only if it is really necessary! If you witness the appearance of forehead lines, let’s say in your mid-twenties and it makes you feel conscious you might give anti-wrinkle injections a try. These injections work by relaxing the underlying muscles and therefore ultimately diminishing the appearance of fine lines & wrinkles on your skin. 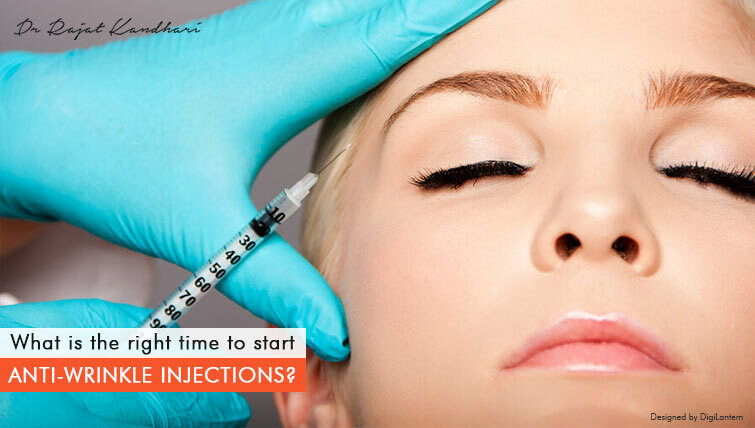 Probably the most important aspect while injecting is the amount injected and the points where it is injected. A prudent injector will treat with the “adequate” amount – the idea is to make the person look younger and fresher and not impart a “frozen” appearance to the face. Preserve the grace of the face and yet diminish the lines. In the 30s, most of us actually start seeing the frown lines, forehead lines or the marionette lines. If you’re someone who keeps your skin hydrated and wears sunscreens regularly, it is less likely that you’ll see fine lines or wrinkles in your 20s or early 30s. Also, depending on the factors such as the muscle movement and the amount of sun damage your dermatologist will suggest how much toxin should be injected to make you look refreshed. You may get these anti-wrinkle injections occasionally or as a regular practice. A lot of people get it done for a special occasion like a wedding or other such significant event. If you wish to retain the results for a longer period of time, you’ll be suggested to get these injections at an interval of 4-6 months or as guided by your dermatologist. Since the treatment is essentially for dynamic wrinkles or the lines which appear when you raise your eyebrows on your forehead (forehead lines), between your eyes on your forehead when you frown (glabellar lines), or the lines which appear around your eyes when you smile (“Crows feet”) it is best done when these lines begin to appear as this will enable as decreased dose, better treatment outcomes and lesser dosing as we age in order to maintain the look. Further, with repeated movement and especially in males with heavy muscle mass or animated facial expressions these dynamic lines can become static, i.e., appear on the face even without movement and this can be prevented if treatment is seeked at the right time. A common question I am frequently asked is – “I am not that old yet do i need it?” – Well the truth is you need it when the indication presents itself (or the lines start becoming pretty obvious) and has nothing to do with age. In the 40s, the anti-wrinkle injections work as a corrective measure to eliminate the fine lines & wrinkles which will appear to be much deeper as compared to that in your 20s or 30s. To be honest, there are no hard and fast rules of when should you start getting these injections. Wrinkles are a part of the natural process of aging and if it concerns you, you could certainly use the anti-wrinkle injections irrespective of your age. You shall discuss your expectations with your dermatologist and depending on your skin health he/she will guide you regarding the amount of anti-wrinkle injection required and the ideal intervals for the same. We understand that ‘people want natural results, they want to look fresher and younger in a manner which is subtle and not in your face’. Therefore, at Veya Aesthetics we follow a methodical, graded and step by step technique for improving features of the face, thereby maintaining a natural and soft look, which is noticeable but not obvious. If you wish to get further details about injectable treatments at Veya Aesthetics, please feel free to write to us at info@drrajatkandhari.com.